There were over 5,000 credit union advocates who attended the Credit Union National Association’s “Governmental Affairs Conference” in Washington D.C. in mid-March. There were thirty-seven Nebraska credit union professionals and volunteer board members who attended this year’s advocacy conference. A highlight of the conference was Vice President Mike Pence spoke to a packed convention center of credit union advocates. In addition to the Vice President, conference attendees also heard from former Secretary of State John Kerry as well as several key Congressional leaders. The Nebraska Credit Union League hosted several events for Nebraska attendees including a Welcome Reception sponsored by Millennium Corporate CU, the Hill Staff Reception sponsored by FHLBank of Topeka and Husch Blackwell, and the Advocates Dinner sponsored by Alloya Corporate FCU. Nebraska’s advocates attended the Nebraska Breakfast which is hosted by Nebraska’s Congressional Delegation each Wednesday that Congress is in session and held individual meetings with each of our Nebraska’s three Congressmen and two U.S. Senators. During the visits to Capitol Hill, credit unions provided specific examples of how credit unions had directly impacted the lives of their members. “Whether it was how the credit union stepped up to help furloughed federal workers during the recent government shutdown, or a credit union employee spending several hours with a family dealing with parental dementia, or the credit union offering financial education to members who are struggling with high debt, or a young couple being assisted with overwhelming debt payments or the credit union investing thousands of dollars in programs to help single mothers and kids transitioning out of foster care. Credit unions have a great story to tell and it’s time we tell it” said Brandon Luetkenhaus, chief advocacy officer of the League. Advocates also urged members of Congress to ensure that credit unions are protected in any reforms of the housing finance system to ensure that credit unions can continue to serve their members with the purchase of a home. Other issues discussed during lawmaker visits were data security, enhancements to the federal credit union act, and continuing the trend of reducing unnecessary and “one-size-fits-all” regulations. 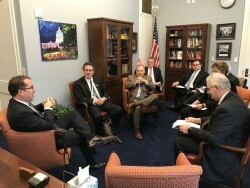 Hill Visit: (Pictured L-R) Congressman Adrian Smith (NE-3); Rex Minert, Archer CU; Scott Sullivan, NCUL; Steve Swanstrom, Centris FCU; Josh Jackson, Smith’s Aide; Jeff Shapiro, Centris FCU; Dee Schriner, Trius FCU; Steve Edgerton, Centris FCU.